Super thin, feather-light - but can it rival the new dual-core brigade? Could LG rival Apple with this new Android smartphone? Sitting alongside the LG Optimus 2X, the LG Optimus Black is a top-end smartphone, slipping in at just over £400, attempting to compete with the Samsung Galaxy S2 and Apple iPhone 4 for the smartphone crown, but with considerably fewer features and less processing power than its LG stablemate. First things first – the LG Optimus Black is light. Weighing a featherweight 109g, it even reaches a skinny 6mm side edge curvature, and 9.2mm thickness at its deepest point, besting the Apple iPhone 4 by a millimetre. Some may feel the lightness cheapens the feel of this handset somewhat, but our jeans pockets were thankful and it was nice to tote around something that didn't weigh us down. The slightly metallic back cover is smooth, and the phone's few soft keys are well-blended into the chassis, giving it a minimalist aesthetic. We have to say, however, that a few of the edges felt a little too rough, detracting from the overall feel of the phone. Yet where it's light and thin and joyous, it's also somewhat long. This makes the LG Optimus Black a little uncomfortable for small hands to hold it portrait, although curved corners help it sit nicely in the paws in landscape orientation. Those with bigger hands will likely feel it sits in the hands just fine either way. But, given the Android UI is designed to be used mainly in portrait mode, those with small hands will find it difficult to use one-handed. Despite its impressive lightness, the length makes it feel a much bigger phone than it is. The LG Optimus Black's 4-inch capacitive NOVA display screen is as bright as an AMOLED – reaching up to 700cd/m2 – but with increased battery efficiency, thanks to "luminance reduction technology". The 480 x 800p display is indeed beautifully bright and clear, perfectly fine indoors or out, even in the most direct sunlight we came across while testing. 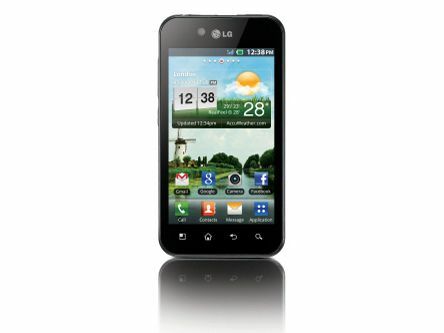 Looking much like the LG Optimus 2X, it packs less power, with a 1GHz processor running Android 2.2. The Optimus Black boasts the usual Android touchscreen buttons, and the three external buttons – a slim volume rocker, power/lock button and the gesture key, part of the LG Gesture UI designed to aid using the phone with one hand (more on that later). As with most minimalist handsets the ports – micro USB slot and 3.5mm headphone jack – sit at one end, alongside the lock and power button. At the bottom end of the LG Optimus Black is an irritatingly tiny slot for removing the battery cover. Good luck opening the thing if you're devoid of long fingernails. In fact, even if you have got long claws, prying off the back cover is a difficult task. Once you get underneath the hood, you'll find the SIM holder, microSD slot and, of course, the battery. This is a sleek handset which packs an impressive 2MP front-facing camera plus a 5MP auto-focus-tons-of-toggling-fun camera with LED flash on the back.